TVS bike’s showroom in Bangalore. Photo: Hemant Mishra/Mint. 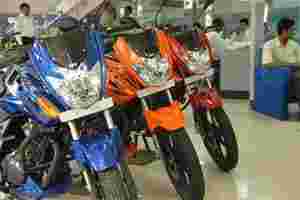 TVS Motor Co. Ltd put up a stellar show for the September quarter, as two-wheeler manufacturers bucked the economic recession that had hurt other auto makers. A superior product mix and sales growth across product categories boosted volumes by 15.5% from a year ago. Growth in revenue was driven largely by the 27.2% year-on-year (y-o-y) growth in scooter sales, followed by the 20% growth in three-wheeler sales. These two segments enjoy better profitability and, hence, support operating profit margins. Perhaps, that’s the reason the fall in operating margins was restricted to a mere 24 basis points compared with a year ago, despite the 176 basis points increase in the raw material cost as a percentage to sales during the period. Lower other expenditure and employee costs helped contain expenditure. One basis point is one-hundredth of a percentage point. TVS clocked an 18.9% y-o-y increase in operating profit to ₹ 146 crore. Further, it beat market estimates on net profit that increased by 39.7% from the year-ago period to ₹ 76.5 crore. But the company’s shares did not react to the strong results, closing marginally lower at ₹ 66.30, discounting fiscal 2012 estimated earnings around 11 times. Nevertheless, the management’s reiteration of 15% sales growth this year with strong traction in scooters and three-wheelers is heartening. The 20% y-o-y growth in retail sales in October supports its growth target. Although, the company’s sales were 6.3% lower due to the one-week maintenance shutdown. Also, the management’s forecast of softer commodity prices would help it deliver improved operating profit margin for the full year—a key factor to improve valuations.